Everyday we place our spine and lower back under unnecessary stress, through poor posture while standing, sitting, bending or lifting. Here are some pointers to help maintain correct posture and reduce stress on the lower back during daily activities. When sitting or standing, maintain good posture by keeping the back straight and upright, stomach tight, chest out, shoulders pinned back and chin up. Continuously regaining posture helps exercise and strengthens the core postural muscles. Placing red stickers on computers, or desks at work, the car rear view mirror and on the fridge at home is one helpful method I find for reminding individuals to regain awareness of correct posture. Bending and lifting are activities continuously performed throughout the day. To ensure correct bending technique remember, with a straight back, bend at the hips while bending your knees. When lifting, hold the object close to your body and stand up the same way you bent down. Keeping the feet shoulder width apart also creates greater stability through a wider base of support. This will also distribute the weight evenly across the body making the object easier to lift. Never twist while lifting, position the object to be lifted directly in front of you. Constantly sitting and standing in one position for an extended period of fatigues your core muscles causing poor posture. This in turn applies stress to the lower back and spine. An ideal way of reducing this type of stress is through movement. After 15-20 minutes of sitting at a desk or in a car, it is a good idea to break free from this tiresome position (if possible) and walk around for a minute or two giving the body a light stretch. Later this week we will have more tips on posture and how to do your own posture check. Health Canada states that “inactivity or leading a sedentary life is as harmful to your health as smoking!” So think again if you think that exercise is only for those who need to lose weight! In an ideal world people should treat exercise like brushing their teeth – you don’t wake up in the morning and think “do I feel like brushing my teeth today?” – NO – you just do it. Exercise should be no exception. Since it is so important to our well being and overall health we shouldn’t give ourselves the option of NOT doing it – it should become part of our lives and daily routine. The following aims to motivate you and get you started on a path to increase the amount of physical activity in your life. Proper Alignment: Proper alignment of your spine is essential when beginning a workout program. Just like driving your car when it is in need of an alignment can cause damage and excessive wear, exercising with a body that is out of alignment can also cause damage. You may not even be aware of any misalignments, but once you start exercising and using your body more, it is essential to maintain proper spinal alignment to prevent injury. Desire: You have to want to do it! The question for many people is, “Where do I find the motivation?” This can only be answered on an individual basis dependent on one’s goals and interests. Choose activities and exercises that you like to do, like dancing, hiking, racquet sports, etc. A training partner can also help keep you motivated. Goal Oriented Attitude: Keep your goals simple and well defined. Be specific – “lose one pound a month” is a better goal than “lose 20 pounds by Christmas”. Break larger goals down into smaller realistic goals. Core body stability: The first place you must start in any fitness program is at the core. Stretching and strengthening the muscles that surround the spine, specifically the stomach, and low back creates a stable mid-section that is needed for all sports and conditioning movements. Any muscular weakness or imbalance as well as joint instability at the core predisposes the spine to injury. Doctors of chiropractic are specialized in diagnosing and correcting any muscular imbalances at your core. Strength training: Strength training not only builds strong muscles, it also changes the shape of your body by sculpting your physique. Another benefit is that increased muscle mass increases your metabolism. This means you will burn more calories while at rest. Three total body sessions a week is sufficient to see results. Cardiovascular training: Aerobic exercise is an excellent way to burn fat and strengthen the cardiovascular system. Activities such as brisk walking, riding a bike, tennis, or swimming not only burn calories, bur increase your metabolism so that you continue burning fat for up to 48 hours after the exercise. Three – 30 minute sessions a week are minimum to achieve this effect. Mix up your choices of aerobic conditioning so you don’t get bored. Flexibility: Keeping your muscles limber and pliable helps you avoid injury. Stretch only when your muscles are warmed up. The best is after 10 minutes of a low intensity activity like walking. At the start of any flexibility program, go slowly and within your limits. Healthful Nutrition Habits: a good nutritional program should provide you with these four results: decreased body fat, increased energy levels, increased mental focus, and decreased hunger and cravings. Volumes could be written on nutrition and since even the experts disagree on what is best it’s easy to become confused. It is up to the individual to learn more about their body to see what works best for them. Recuperation: Your body becomes fatigued with exercise. It rebuilds and replenishes itself in-between workouts. Rest and recuperation is as important as training – you must get enough! Plenty of restorative sleep on a good mattress and with a pillow that is appropriate for your size will allow your body to respond favourably to your workouts. Consistency and Progression: Realistically, it takes time to attain better physical conditioning. Think months instead of weeks. If you’re having fun, the time will fly by and the results will speak for themselves. If you fall off the wagon for a few days or weeks, hop right back on and don’t feel guilty. Don’t ever give up on yourself for the dividends that exercise and nutrition pay are worth it. You can do it! Heel pain, worse with the first few steps in the morning, or at the beginning of a sporting activity. A common foot problem in sports participants and people that stand/walk for extended periods during the day. 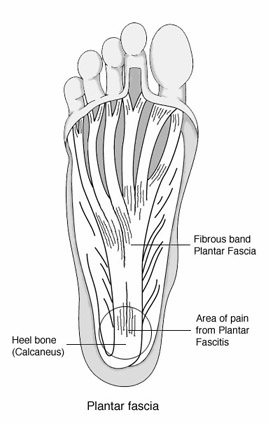 The plantar fascia is a thick fibrous band running the length of the arch from the heel bone to the ball of the foot. With repetitive stress, such as prolonged standing, walking or running, the fascia becomes strained resulting in micro tears, most often where the fascia attaches to the heel bone. There is no quick solution! Many of these treatment protocols, such as muscle strengthening, take time. Dedication to your treatment will help you overcome this syndrome and return to your healthy, active lifestyle. They support the arch and control overstretching and tearing of the plantar fascia. Your therapist will teach techniques to increase fascia flexibility and reduce inflammation, scar tissue formation and adhesions. A qualified person must teach this to prevent more damage. You may need different/new shoes. A GaitscanTM analysis determines the best type of shoe for your feet. Always wear supportive and shock-absorbing footwear and avoid walking barefoot. Use pain as your guide. Avoid prolonged standing, weightbearing activities and walking on hard/rough surfaces. Return to weightbearing sports slowly. Severe pain during activity or the following morning indicates you’re doing too much. Place on your heel for 15 minutes several times a day to reduce inflammation. Your therapist will teach you to strengthen the small muscles of your feet and improve the flexibility of your plantar fascia and Achilles tendon. This will support the arch and reduce stress on the weakened, inflamed plantar fascia. Soak your feet each night in a warm (not hot) Epsom salts bath. Ultrasound and therapeutic taping reduce pain and inflammation. We aim to assist you in becoming a better, injury-free runner by addressing problem areas BEFORE full-blown injuries result. This improves performance and REDUCES down time and COST. A little something for you to think about. A little Friday morning motivation and inspiration. Maybe even help with your continued efforts towards your new years resolutions. Know your outcome. Define what you want. Develop flexibility to change your behavior until you get what you want. B12 is a water soluble vitamin that helps the body form red blood cells, replicate DNA, lower homocysteine levels and aids in nerve function. Your body needs B12 to create energy and without it, you can end up feeling sluggish, tired and unwell. Adequate levels of B12 in the body rely on a very healthy diet AND on our ability to activate and absorb the B12 in our food. Since we don’t always eat well and conditions such as stress and poor digestion (among many others) decrease our abilities to absorb this crucial vitamin, it’s no wonder many people are deficient. How do you know I’m deficient? The most common way to test for B12 levels is through a B12 blood test. Unfortunately, this method is not a very accurate way of assessing the level of B12 available to your tissues. Clinically, I see countless clients with obvious signs of B12 deficiency, who have had the blood test and been told they are not deficient. They spend years suffering because of an inadequate test. A much more accurate way to assess is a newer test called ‘methylmalonic acid’. This substance increases in your blood if you are vitamin B12 deficient. Another way to test is to just try a vitamin B12 injection. I use a preservative-free, high concentration formula. Most of my clients that have a deficiency will see some sort of improvement over the next 48 hours if they are deficient. This is generally an improvement in energy and concentration but can also be improved sleep, reduced anxiety and improved mood. One vitamin B12 injection will not correct a long term deficiency but it is a starting point! B12 can probably help YOU! Vitamin B12 is involved in many pathways in the body. It’s no wonder we feel so much better when our levels are correct.